Just Add Ink: Just Add Ink #355....Winners! What a fabulous response to this weeks sketch challenge! We had lots of lovely projects and enjoyed popping by your blogs for a closer look...Lovely work ladies! But as the saying goes...there can only be one winner! 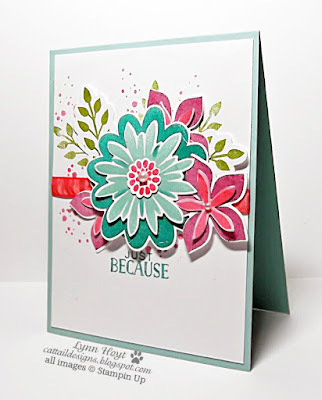 This week we have voted and chosen Lynn as our top pick with this stunningly colourful creation. Love the elegance of her colourful flower arrangement. Beautiful use of vibrant colours showcase these blooms beautifully. Love this Eastern Beauty!!! Great texture & colours. Sophisticated and elegant I love how Jan accentuated the design with touches of gold. Heather's design is delightfully moody in purples! Lovely card. Love the soft colours and cute bird design! The background texture is perfect for this sweetly coloured bird. Thanks so much for the HM! I had so much fun with this challenge - thanks for inspiring me each and every week! Just Add Ink #356..."Just Choose Two"
Just Add Ink # 354 Winners! Just Add Ink #353.... Winners!